"… Before reaching Ister river, he ( Darius ) conquered the Getae tribe first. In spite of their brazenness they were conquered at once because they before recklessly. …"
To the east and west of the town of Gets there are two large tumular necropolises - the last dwelling of the noble Getae. There exists a hypothesis that the separate groups of mounds are arranged so as to be the mirror image of certain constellations - "Veronica s Hair", "Orion", "The Plug" and "The Great Dog". The investigated mounds reveal finds of human and animal burials, local and imported vessels, articles of adornment and other burial gifts. 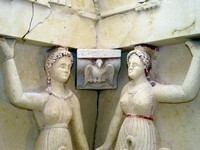 The Sveshtari tomb, the miracle of Thracian sepulchral architecture, was discovered below Ginina Mogila mound in 1982 during regular archaeological excavations under the guidance. Built of large limestone blocks, it consists of a dromos (corridor) and three premises (chambers), each of which is covered by a separate vault. The decoration of the central (burial) chamber is exceptionally rich. Four different Doric and one Corinthian column support a frieze with triglyphs and metopes, between those there are ten female figures (caryatids) with uplifted arms and above them, in the lunette of the vault, is the picturesque scene of deification of the deceased ruler. 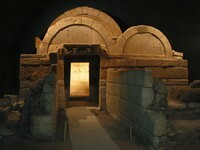 A massive decorative stone door (naiskos) hid the burial bed from the eyes of the mortals. A second humbler bed was designed for the beloved wife, who also followed the deceased in his afterlife, while his favorite horses were laid in the lateral chamber and in front of the entrance to the antechamber. Owing to its remarkable architecture and artistic decoration, in 1985 the Sveshtari tomb joined the world cultural and historic heritage under the protection of UNESCO. After years of studies and conservation, in was opened to visitors on September 30th, 2000.